Australia is one of the most biologically diverse and unique places on earth. 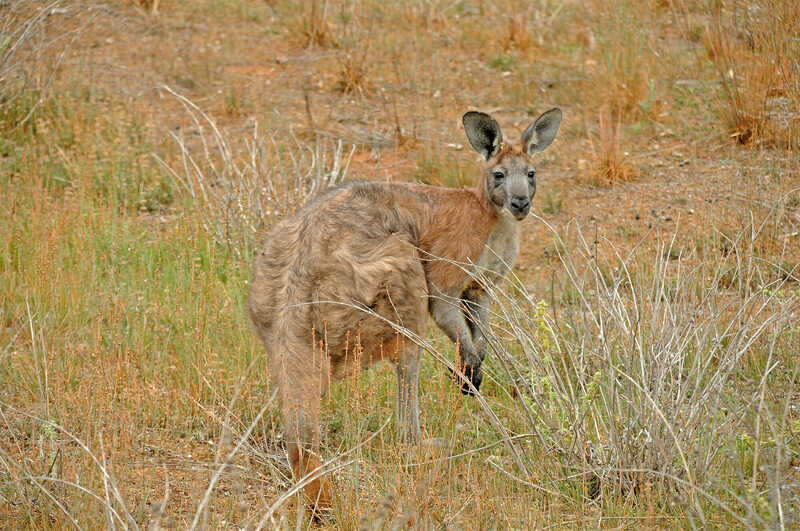 At least 83% of Australian mammals are endemic to Australia, meaning that they can not be found anywhere else. Being an ancient continent, Australia has very poor soils and the plants growing here had to adapt to the low availability of nutrients. 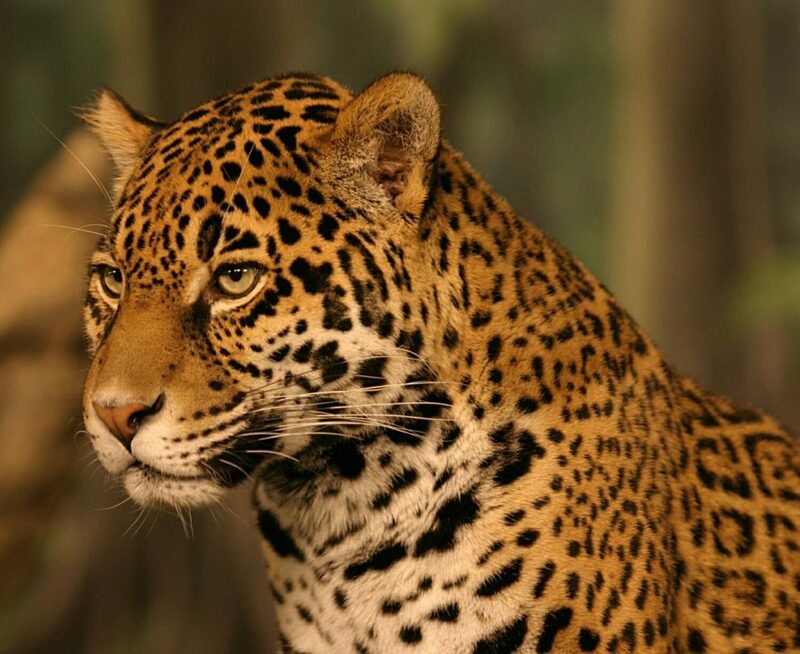 In response, the animals eating these plants evolved to survive on the low energy budget. This is why most of the Australian mammals are marsupial – they are better at surviving in Australia’s harsh conditions. 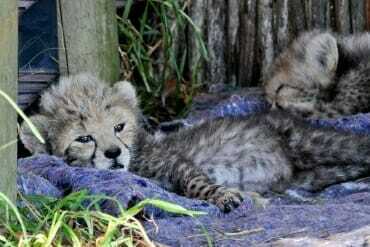 This is also why most Australian mammals do not occur anywhere else in the world. 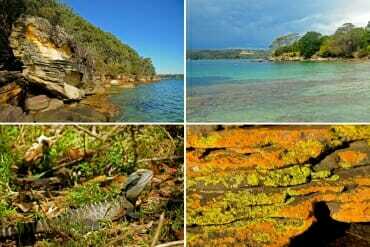 The best way to see Australian wildlife is to visit a diverse range of habitats in different parts of the continent. A couple of years ago, my friend and I decided to do just that. 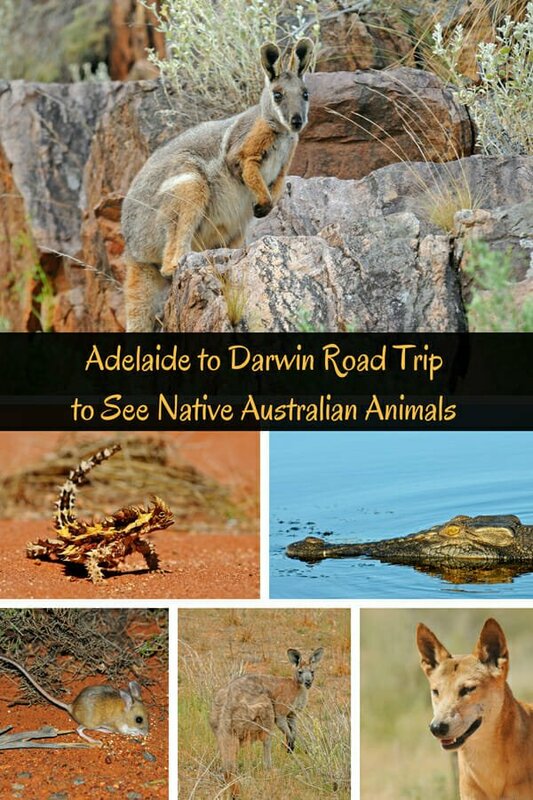 I spent weeks researching the best places to spot wildlife in Australia and in the end, came up with an action-packed itinerary for Adelaide to Darwin road trip itinerary with stops at all major natural and wildlife attractions along the way. 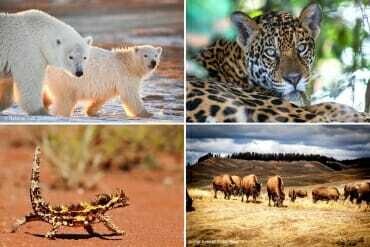 We drove across the entire continent and visited most of the wildlife hotspots along the way. And the beauty of a Northern Territory road trip is that it takes you to some of the most spectacular landscapes Australia has to offer. We chose to camp on this trip, and it worked out very well, as some of the places we visited didn’t have any accommodation available. Another way, of course, would be to make this journey in a camper van, which you could pick up second hand on a site like Gumtree. 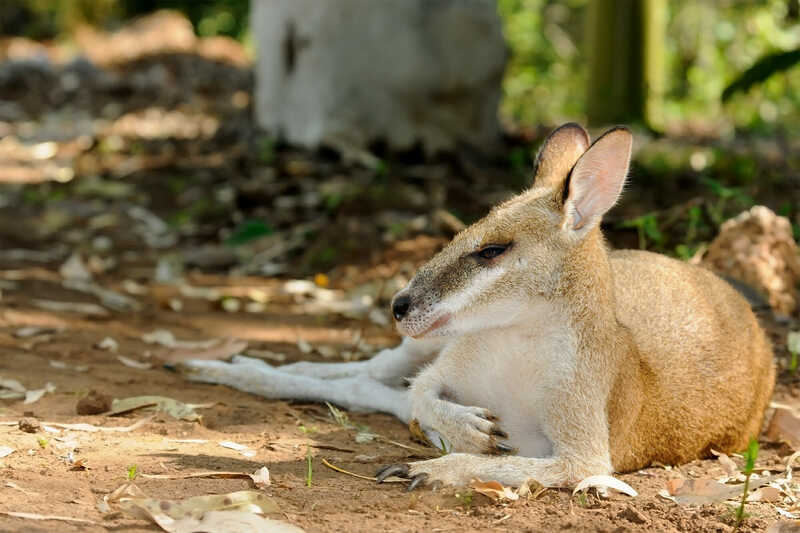 If you are curious to know what some of the best places to see wildlife in Australia are, peruse our itinerary below and see what we found. 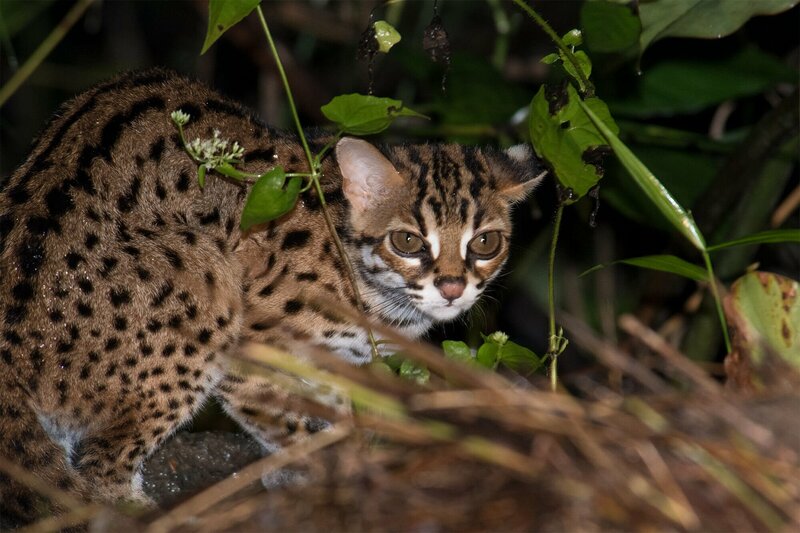 To find out more about our sightings at each destination, follow the links under each entry. Adelaide to Darwin is an iconic Australian road trip, so we decided to follow the convention and start our trip in Adelaide. 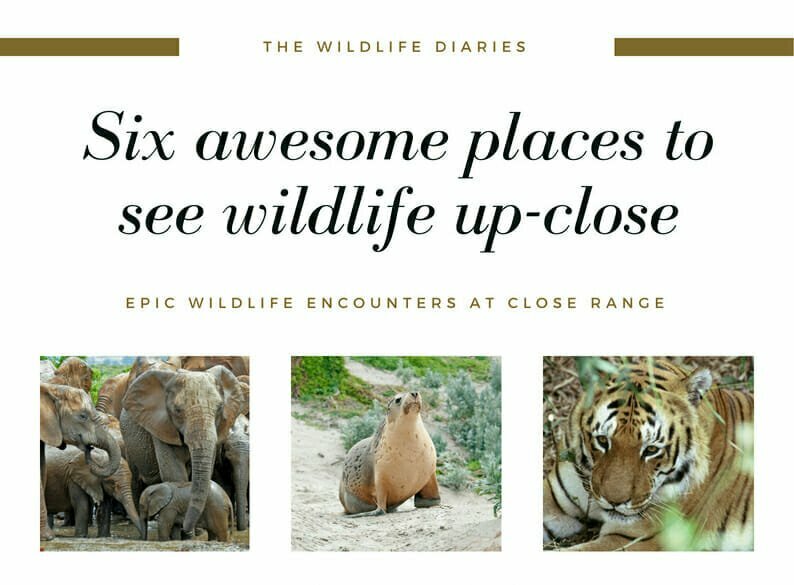 Because of its position on the coast, Adelaide is the perfect base for exploring South Australia wildlife attractions. 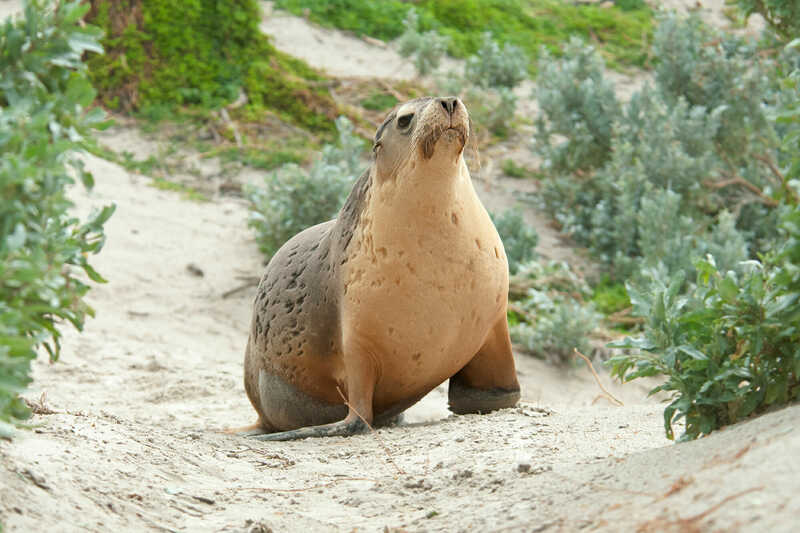 The Kangaroo Island with its sea lions & koalas is within easy reach. Victor Harbour – a whale watching hotspot, is even closer. 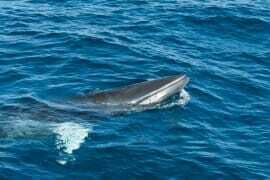 Or you can take a dolphin watching cruise straight from Adelaide. 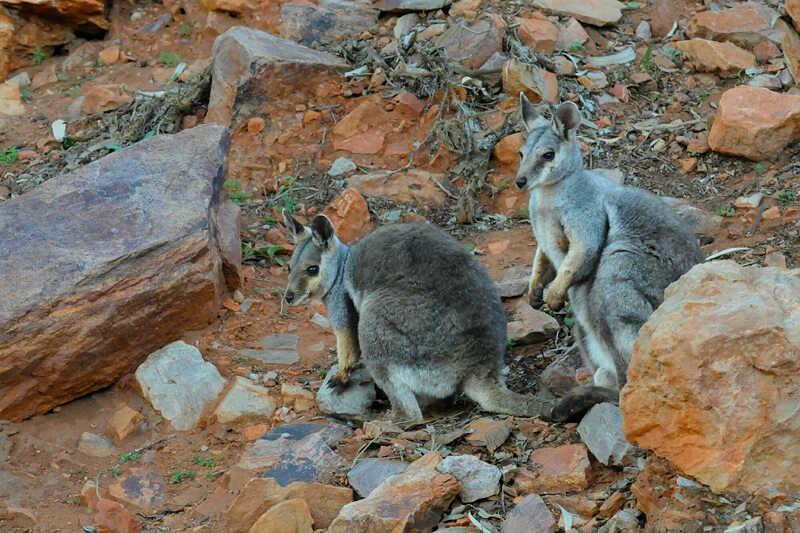 We have explored the area on earlier trips, and this time we headed straight for Flinders Ranges National Park – home of the adorable Yellow-footed Rock-wallaby. One thing you appreciate on a road trip across Australia is just how huge the country is. 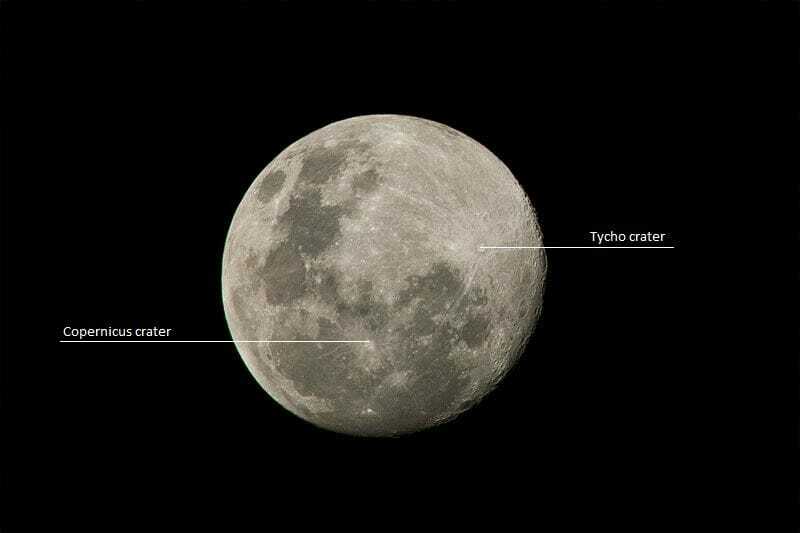 Especially when driving through the interior of the country, where most places of interest are at least 500 km apart. As we left Adelaide, our GPS happily announced that we had 468 km to go until our destination in Flinders Ranges National Park. Flinders Ranges is the largest mountain range in South Australia that is millions of years old. You reach it about 200km north of Adelaide, and it makes for a very scenic drive. We camped at Wilpena Pound, and our wildlife adventures started right at the campsite the following morning. 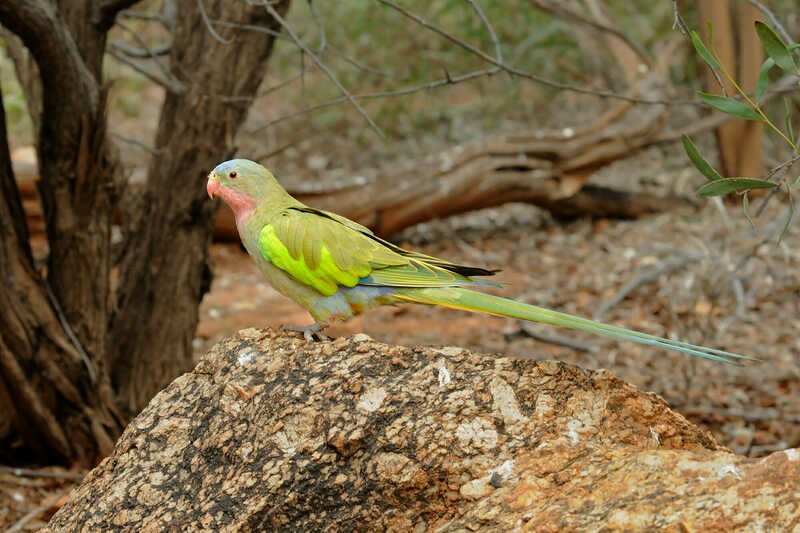 Western grey kangaroos snoozed in the shade, bright-coloured Mallee Ringneck parrots hopped on the ground between the tents and Apostlebirds perched in the low-hanging branches. As the first order of business, we drove to the spectacular Brachina Gorge, and sure enough, we spotted some Yellow-footed Rock-wallabies sunning themselves in the early morning sun. I personally think that they are the most good-looking macropods in Australia. 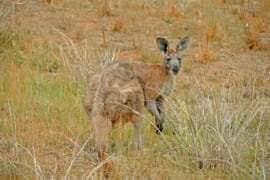 As we drove around the park, we spotted plenty more of iconic Australian animals: Common Wallaroo, also known as Euro, Red kangaroos, Emus – Australian largest birds and a Brown Falcon perched right by the road on a hilltop. The following morning, we took the 7km walk to Wangara Lookout on the rim of Wilpena Pound. As expected, the rocks of the pound we very good for reptiles, especially the Peninsula dragons. We could’ve easily spent days exploring Flinders Ranges, but we had places to go & things to see, so after the walk, we packed up and hit the road heading north. At 712 km, the drive from Flinders Ranges to Coober Pedy is epic even by Australian standards. It is of course, possible to break the journey in Port Augusta, but I’ve already been there twice that year, and it is not an interesting enough town to keep revisiting. So, we pushed on all the way to Coober Pedy. We arrived after dark and straight away checked in at the Underground Motel – the town’s specialty. It was not obvious at night, but we knew that Coober Pedy is a ridiculously hot place. In the middle of the day, the ground temperatures here may reach 60 degrees centigrade. To avoid the scorching heat, most of the town’s service buildings are located underground. There are underground apartments, underground shops and hotel, an underground church and even an underground caravan park! The town is a fun place to explore and you can even try your hand at digging opals in Coober Pedy! 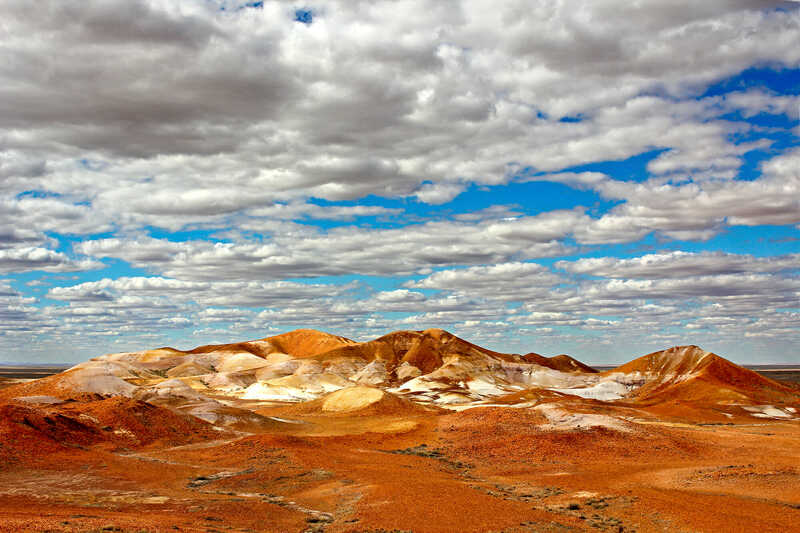 The most spectacular natural formation near Coober Pedy is the Kanku-Breakaways Conservation Park, 33 km out of town. 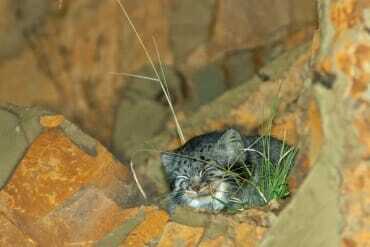 There isn’t much wildlife above ground in the Breakaways, not during the day. But the landscape of the park is certainly worth a look. It looks like something straight out of a sci-fi film. In fact, it is. The first film in the Chronicles of Riddick, Pitch Black, was filmed here. The stark landscape of the Breakaways is made up of a series of multi-coloured eroded mounds rising over the desolate rocky plane. The plane, known as the stony gibber desert in Australia, looks remarkably similar to the images from the surface of Mars. Before leaving the Breakaways, we checked out the Dingo fence – a 5,614 km construction built in the late 1800s to exclude dingos from the sheep country in southeastern Australia. North of the fence, where we were heading, sheep are replaced by cattle that are not as vulnerable to dingo predation. This was another epic day on the road. Uluru is almost 690km from Coober Pedy. Thankfully about halfway along, we crossed the South Australia / Northern Territory border, and the speed limit increased to 130 km/h. When we arrived at Yulara, the service village for the Uluru-Kata Tjuta National Park, we were thrilled to discover a very inviting swimming pool at the Ayers Rock Resort’s campground. Uluru, also known as the Ayers Rock, needs no introduction. It is by far the most recognizable Australian landmark. The nearby Kata Tjuta is another interesting geological feature made up of boulders and cobbles of different sizes and rock types. We spent three days exploring the park, walking in the early hours to avoid the heat of the day and driving around in the middle of the day. 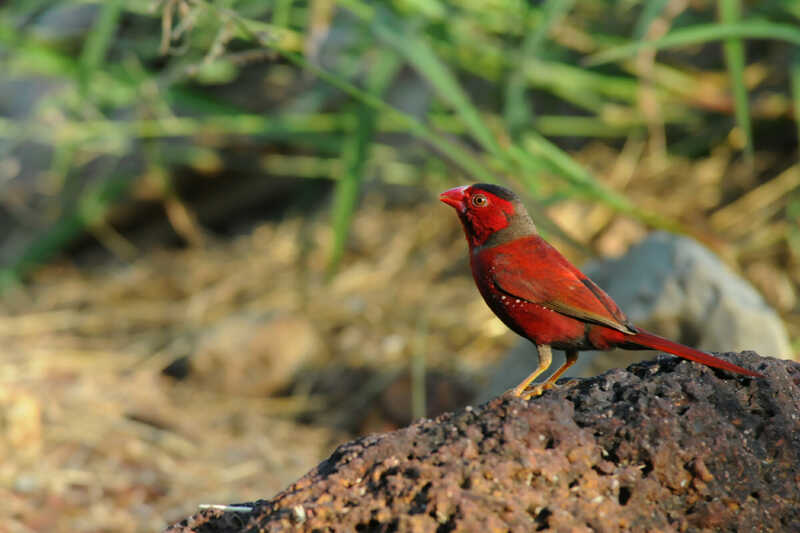 We spotted plenty of desert-dwelling birds during our walks, the most memorable being the brightly-painted Zebra finches, Mistletoebird and Spinifex pigeons. But most of the wildlife spotting took place after the sunset. Uluru lookout gets quite crowded just before sunset, with visitor lining up for those iconic views of the Rock changing colour under the setting sun. But as soon as the sun dips below the horizon, ALL visitors leave and miss seeing a little wildlife spectacle. Even before the last cars drove off, we could see some movement in the grass. Minutes later, the car park became the hive of activity once again as Spinifex hopping mice emerged to browse on the crumbs left after the day of tourist activities. The hopping mice are rodents, not marsupials, but very have long and powerful back legs that allow them to hop like the tiny little kangaroos. Among the hoppies, there were some Sandy inland mice and some feral House mice. We also had all three species at the campsite, particularly on the dunes near the kitchen. There is a short walking trail at the entrance to the campsite that leads to the top of a dune, where you can find an abandoned corrugated iron shack. We found some Broad-nosed bats roosting in it. Our next few destinations were in reasonably close proximity of each other, which meant that we could explore at a much slower pace and spend more time at each spot. From Uluru, we headed to the Kings Canyon – another stunning geological feature of Australia’s Red Centre. We camped at the Kings Canyon Resort, and this is where I saw my first ever Dingo. First thing in the morning, I unzipped the tent door, and there it was, standing just a couple of meters in front of me, sniffing something in the grass. After the exciting dingo encounter, we spent the morning hiking the Grand Canyon Rim trail. With the day temperatures reaching mid-40s Centigrade, this walk is best done before the sun gets too high in the sky. We didn’t spot much wildlife on the walk, apart from a very well camouflaged Ringtail dragon, but the scenery of this monumental landscape easily compensated for the lack of wildlife activity. The car park, however, was teaming with life. Hooded robins, Spinifex pigeons, Diamond dove, Crested pigeon, Grey honeyeater and even a Rock ctenotus were all happy to escape the heat of the day under cover of trees and bushes. 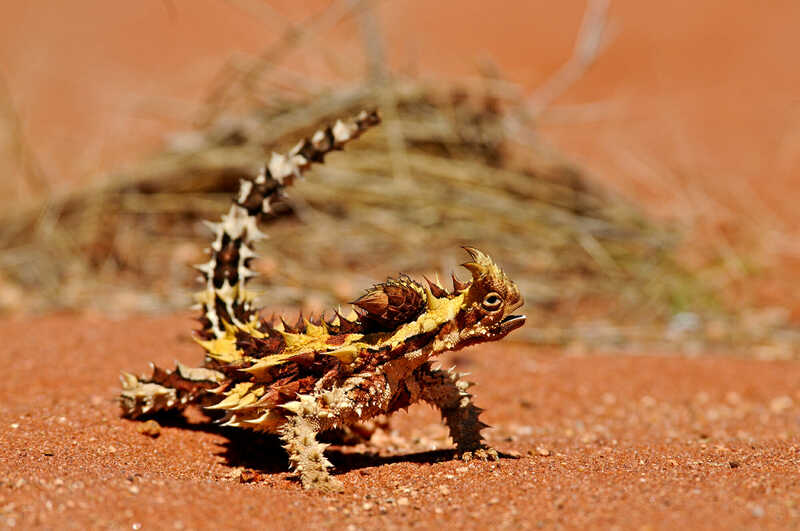 The following day we spotted one of the most unusual Australian animals – the Thorny Devil. Apart from a menacing array of conical spikes, this desert lizard is endowed with a false head! Just to confuse the predators (and some tourists). From the Kings Canyon, we followed the Mereenie Loop Road to explore the West MacDonnell Ranges. 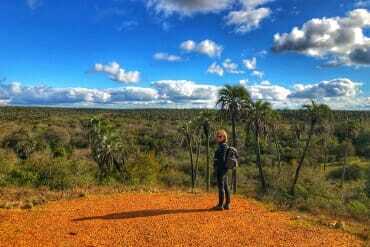 Our first stop was the Palm Valley – the least explored part of the ranges. Located within Finke Gorge National Park, Palm Valley is one of the most unusual places in Central Australia. Here, one of the most ancient rivers in the world cuts its way through a rugged gorge, creating a valley filled with Red Cabbage Palms. It is thought that the palms originated here back when the area enjoyed a gentler tropical climate. The access road to the valley is very rough and requires a high-clearance 4WD and a cautious approach. When we arrived at the campsite, we were happy to discover that we were the only visitors – we had the entire valley to ourselves. We found our first wildlife species, Spencer’s burrowing frogs, on the river bank at the campsite. These unusual amphibians spend most of the year in the subterranean chambers that they dig for themselves – a perfect adaptation for life in the arid environment. 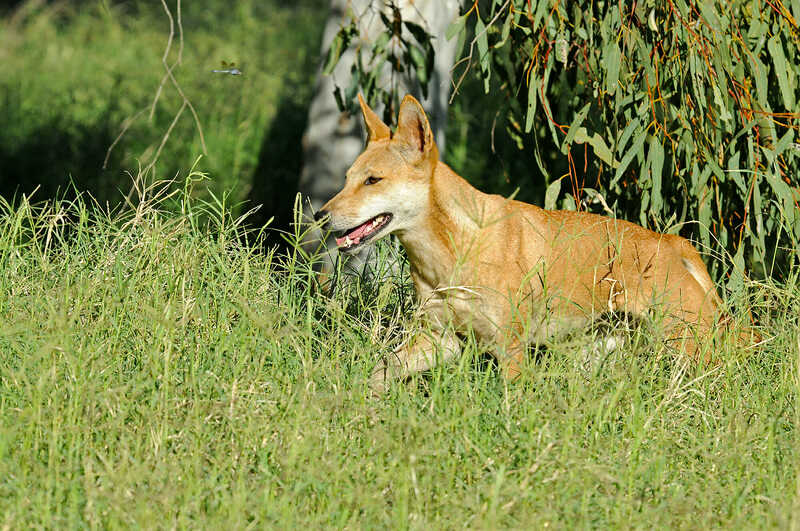 The following morning a beautiful female Dingo visited us at the campsite and stayed with us most of the morning. Back on the Mereenie Loop, we headed to Glen Helen Gorge where we spent a lazy afternoon watching birds coming to the river for a drink. There was a flock of noisy Zebra finches, some Spinifex doves, and even a Great cormorant! Next stop was the Ormiston Gorge, but we had most of our wildlife sightings along the road. I spotted my first-ever Brumby – a feral wild horse and a flock of Budgies. 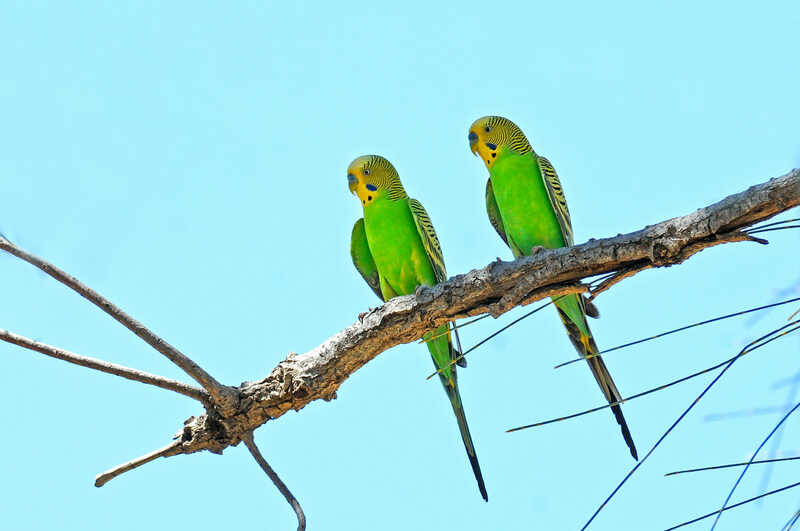 When I was a kid, I used to have a pet Budgie, and for a moment it seemed crazy that I was now living in a country where Budgies live in the wild. The gorge itself turned up Dusky grasswrens, Brown honeyeater and Grey-headed honeyeater, as well as a couple of distant Black-footed rock wallabies at night. In the morning, I took a dip in the swimming hole and found some company – a Perentie – the largest goanna in Australia, rustling in the reeds. Our last stop on the way to Alice Springs was the Simpson Gap where we hoped to watch Black-footed rock wallabies sunning themselves in the late afternoon sun. Unfortunately, as soon as the wallabies emerged, a Wedge-tail eagle appeared overhead and the wallabies scattered out of sight. The eagle seemed to be involved in some dispute with a family of Peregrine falcons which continued until sunset. Luckily, we got a chance to watch some Red-tailed black cockatoos at the park’s headquarters on the way in, so not the entire afternoon was unlucky. After almost two weeks on the road, we arrived in Alice Springs and used the opportunity to re-stock, have some decent coffee and run some domestic chores. Neither of us like the city much, so we spent the day at the Alice Springs Desert Park checking out some of the wildlife we missed in the wilderness. In the late afternoon, we took a quick trip to Heavitree Gap caravan park to watch the Black-footed rock wallabies at close range. 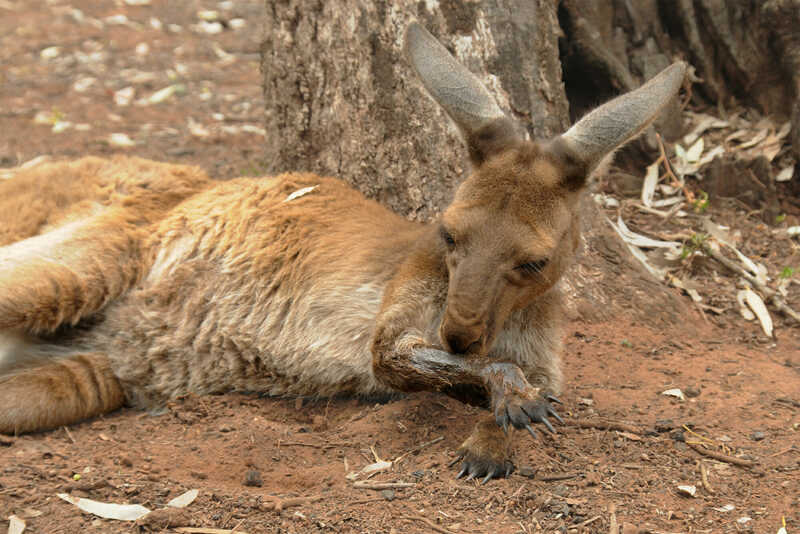 The animals live in the hills above the park, and you can even buy some pre-packaged wallaby food at the park’s shop. So far, we’ve been visiting mostly well-known, even iconic parts of Central Australia. But our next destination was completely off the radar, and I was very excited to check it out. Old Andado is a former cattle station that lies on the edge of the Simpson Desert, 330km south-east of Alice Springs. The homestead of the now abandoned station functions as a free museum of Outback life in the 1920s. You can camp for free in the home paddock or stay in one of the basic dorm rooms for a small fee. 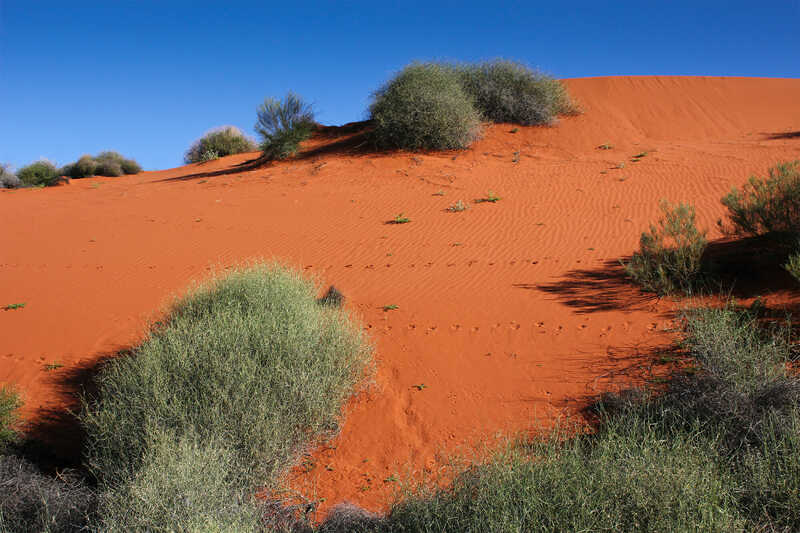 But for us, the most interesting part was the surrounding landscape of bright red sand dunes and the Australian desert animals living there. In the desert, life flows in boom and bust cycles, as animals respond to the change in conditions from drought to rainfall. And we happened to be visiting during a very obvious boom. There were more birds around the homestead than I saw in any one place in Central Australia. Galahs, Little Corellas, swallows and martins moved around in large groups and Black kites perched in trees in their dozens. At night we explored the dunes that were teaming with rodent activity. 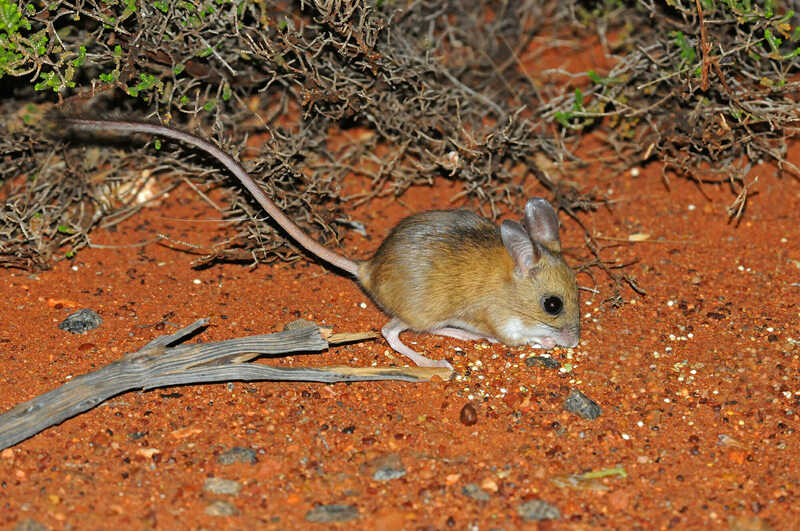 Spinifex hopping mice, Australian Desert mice and Long-haired rats were busy raising their young before the period of bounty ended. I recently learned that a group of mice is called a mischief of mice, and these guys certainly looked quite mischievous. 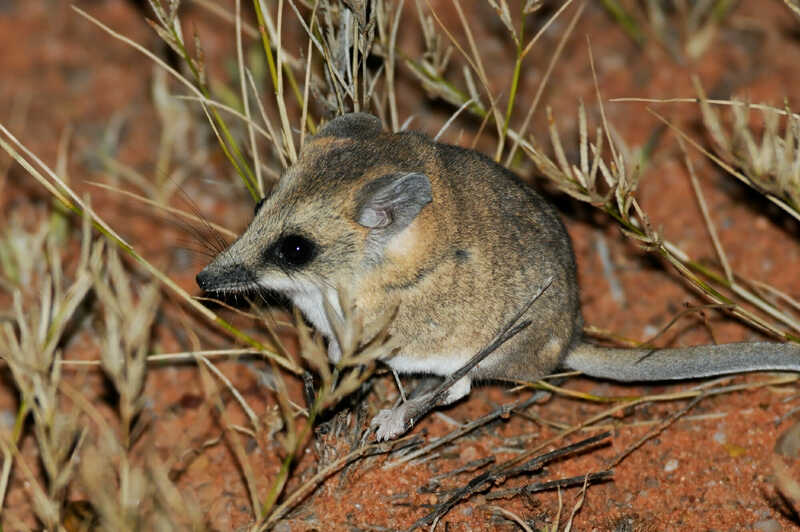 On the gibber plains, we spotted a Lesser hairy-footed dunnart and dozens of desert frogs. 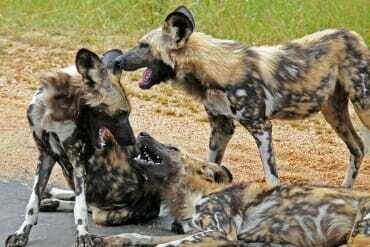 Such an abundance of prey attracted high numbers of predators. 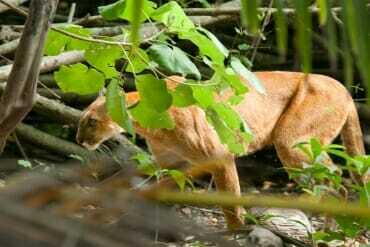 Apart from Dingos, we spotted a cat and a fox – both species introduced to Australia by the European settlers and largely responsible for severe biodiversity loss in Australia. 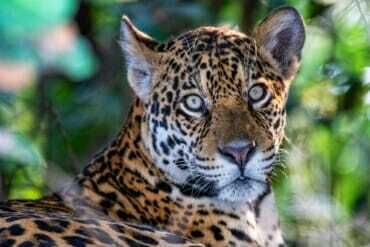 There is a concept of the Critical Weight Range in the field of Conservation Biology in Australia to identify the native species that are at the highest risk of predation by the two introduced predators. Most species in this weight range, like the iconic Bilby, Numbat and the candy floss- like Rufus hair wallaby, have undergone dramatic population declines that placed them on the Endangered Species List. After a night in Alice Springs, we hit the road again and started the second part of our Northern Territory road trip. Though, while we crossed the Tropic of Capricorn 30 km north of Alice Springs, we haven’t felt the increased humidity the entire first day of driving. We drove as far as Wycliffe Well – The self-proclaimed UFO Capital of Australia, where we camped among the alien paraphernalia. The reason we stayed at Wycliffe Well was its proximity to Devils Marbles or Karlu Karlu – a curious rock formation made up of rounded boulders precariously balancing on top of each other. One of the most recognizable symbols of Australian Outback, Devils Marbles is also one of the most visited reserves in the Northern Territory. Though when we visited, at about 9 in the morning, there were only two other cars parked at the entrance. 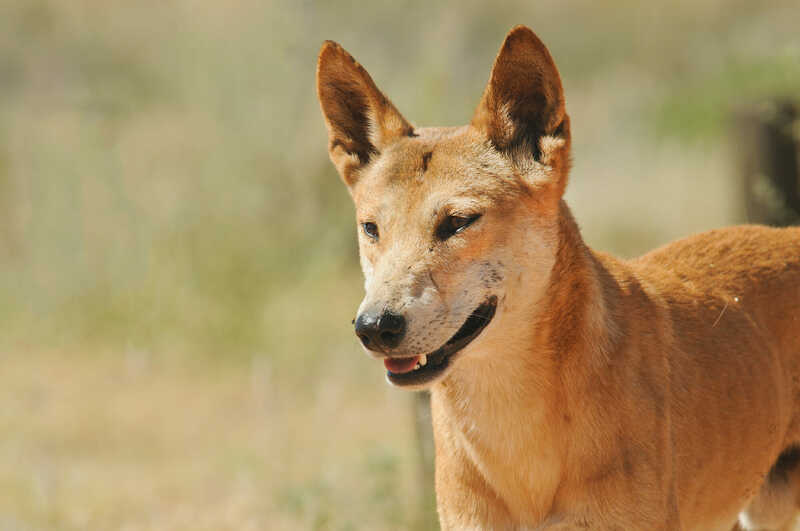 And a Dingo! Exploring the boulders, we found a pair of courting Painted finches, a Spinifex bird, a tiny little Weebill and some Diamond doves. From the Marbles, we got on the road and drove north pretty much for the rest of the day until arriving at Mataranka campground late in the evening. Stepping out of the car at Mataranka in Elsey National Park, we knew straight away that we had reached the tropics. Even in the evening, it felt like a sauna. And humid heat at night usually means that a lot of frogs will be out and about. Before turning in for the night, we went on an exploratory walk around the campground and found some giant Northern Green Tree frogs, Rocket frogs, Roth’s tree frogs, Ornate burrowing frogs and the inevitable Cane toads – an introduced species that is steadily making its way across Australia wiping out native wildlife. In the morning, the campground was a different world entirely, dominated by the Agile wallabies on the ground and Little red flying foxes in the canopy. The Agile wallabies are the most common Australian native mammals in the Top End, but this was my first encounter with them, and I was fascinated by their familiarity with people. A relaxed female was snoozing so close to our tent that she was practically leaning on it. The main attraction of Mataranka, the hot springs, was very busy, so we headed to the slightly less popular Bitter Springs for a swim and found a Merten’s water monitor munching on a crab. From Bitter Springs we headed to Katherine Gorge, locally known by its Aboriginal name – Nitmiluk. Typically, the main reason for visiting Nitmiluk is to take a Katherine Gorge river cruise, but in April, the water still runs too high & too fast after the rainy season. So we explored the area on foot. There were plenty of birds at the campsite: Bar-shouldered dove, Silver-crowned Friarbird, Great bowerbird, Australasian yellow oriole, Red-winged parrot and Blue-faced honeyeater. The walk along the river turned up some Agile wallabies, a Forest kingfisher, Collared lorikeets and an elusive Oriental cuckoo. 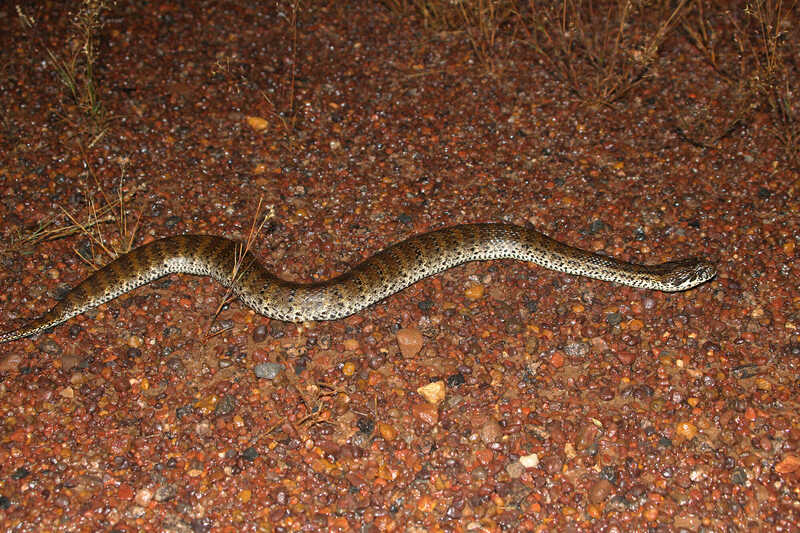 At night we walked around the campsite and found a Brown tree snake, a few Rocket frogs and a couple of Bush Stone-curlews, which are more often heard than seen. Their wailing cry at night is not a sound for the faint-hearted. It’s only 230 kilometres from Katherine Gorge to Kakadu National Park – a breeze of a drive, compared to some of the distances we covered on this trip. And of all the Northern Territory National Parks that we visited, Kakadu was the most remarkable. 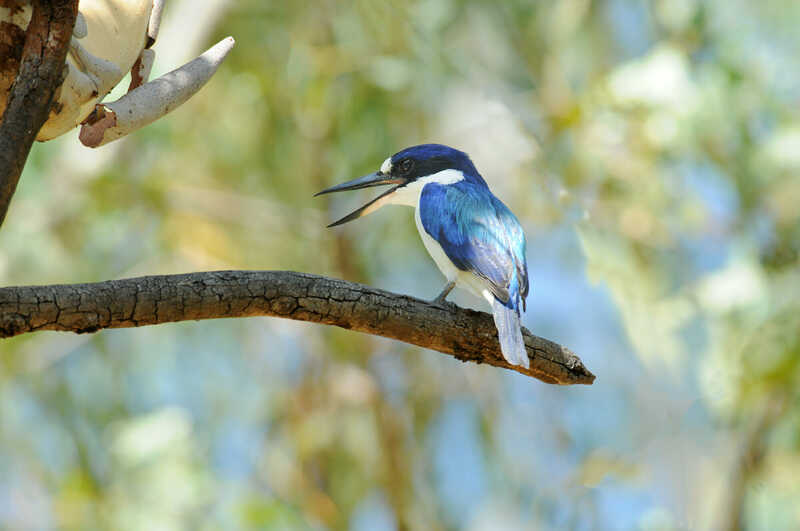 Wildlife watching on the Yellow River Billabong must be some of the finest in the country. We’ve done two billabong cruises because we simply couldn’t get enough of this spectacular place. 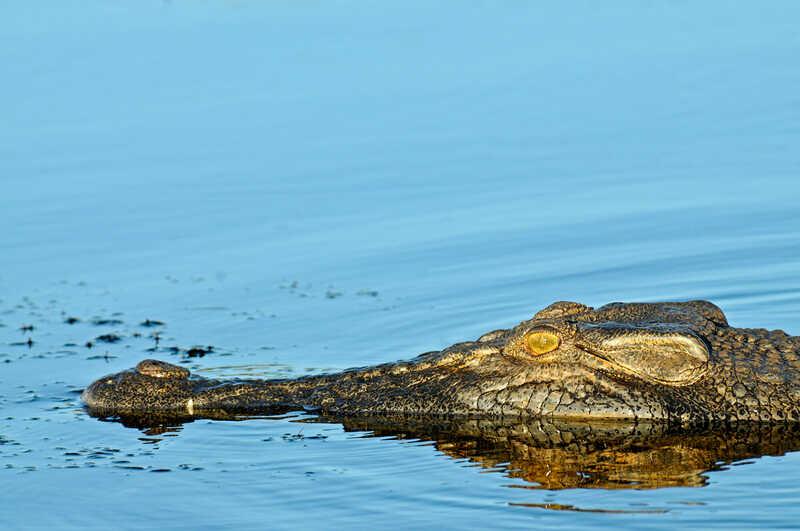 Giant Saltwater crocodiles, Crested jacanas (known as Jesus birds for their ability to ‘walk on water’), Jabiru stalks, White-bellied sea eagles, Kingfishers & Bee-eaters – the amount of wildlife on the Billabong is astonishing. But there is more to Kakadu than the Billabong, of course. They Ubirr rock, famous for its Aboriginal art, is also a good place to spot the Short-eared rock wallabies. Other mammals we spotted while exploring the park were: Dingos, Agile wallabies, Black flying foxes, a Northern Brushtail possum and a Black-footed tree rat. We also found three different species of pythons: Children’s, Black-headed and Carpet. And all that in just two days! 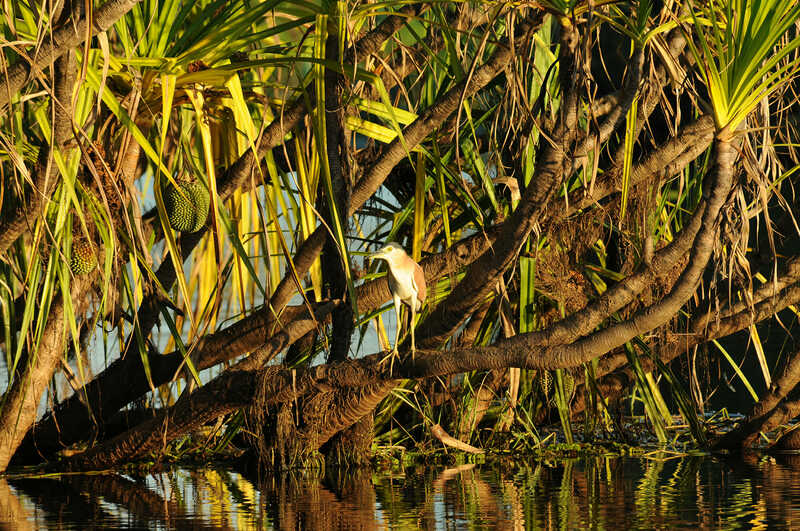 Kakadu is a must for anyone with an interest in seeing native Australian animals in the wild. Our next destination – Mary River was 210 km from Kakadu, along the Arnhem Highway, but we spent the best part of the day on the road. Why? 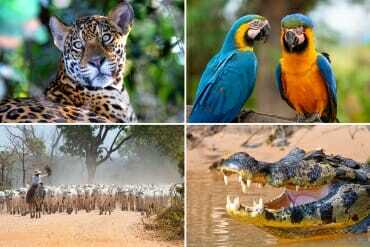 Because Arnhem Highway is a wildlife watching destination in itself, much like the Transpantaneira Highway in the Brazilian Pantanal. The grassy paddocks on the sides of the road were absolutely teeming with birds. We constantly stopped and got out of the car to explore the various hubs of activity. 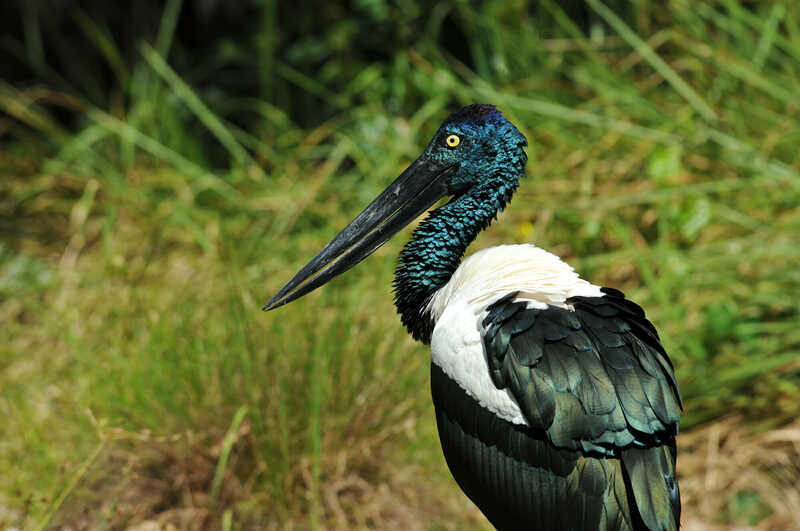 There were Jabiru stalks, Magpie geese, Gull-billed terns, Raja shell ducks and sparkling-white egrets in breeding plumage. We arrived at Mary River just in time for the afternoon cruise. And even after Kakadu, we still managed to find new species here, including the rather cute Freshwater crocodiles and the impossibly vivid Azure kingfishes. Our last destination before reaching Darwin was Fogg Dam. The dam was created to flood the surrounding countryside & and turn it into rice paddies. 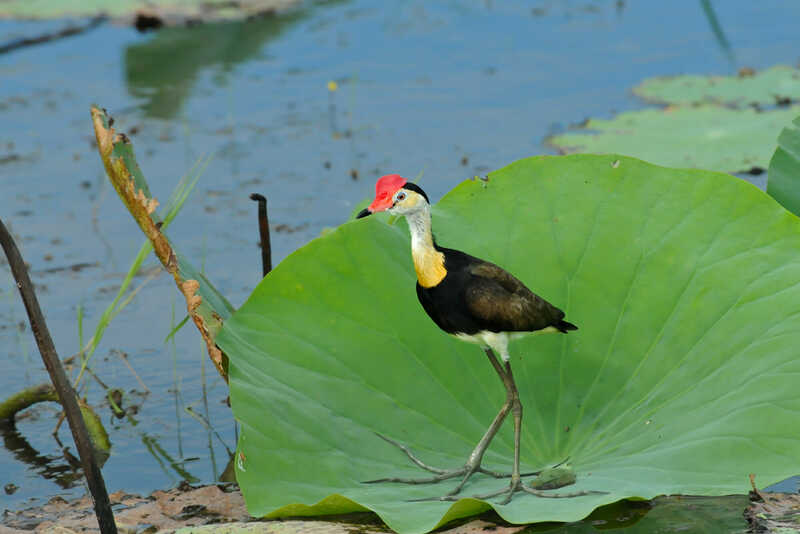 And if a dam does not immediately sound like a winning wildlife destination, here is an interesting fact about Fogg Dam – it supports the highest biomass of any place on earth. 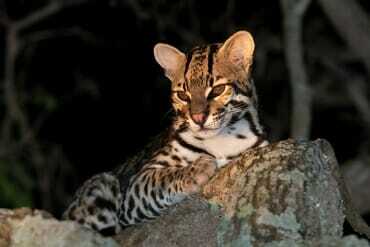 It is home to a huge population of Dusky rats and the equally impressive numbers of Water pythons and Olive pythons, that prey on the rats. Apart from the rats and the pythons, we spotted a few Barking owls, Nankeen night herons, Large-tailed nightjars and Tawny frogmouths. Oh, and the Saltwater crocodiles, of course! One word of warning for Fogg Dam – bring plenty of insect repellent and keep your car windows rolled up when you can. The amount of bugs in the air is staggering. By day, Fogg Dam is the domain of waterbirds. They congregate here in the hundreds, and in April, many species spot their striking breeding plumage. Botanic gardens are always a good place to see urban wildlife and Darwin’s gardens were not an exception. We spotted our first Blue-winged kookaburra, as well as some Double-barred and Crimson finches, not to mention the more common species of Darwin wildlife that we have already encountered on our trip. Darwin’s Lee Point is the perfect illustration of what an Australian beach looks like when it’s not overrun by people. Since swimming is not on the cards in the Top End (thanks to the crocs and the deadly jellyfish), the beaches are not of much interest to the sunbathers. Instead, they were occupied by all kinds of birds. 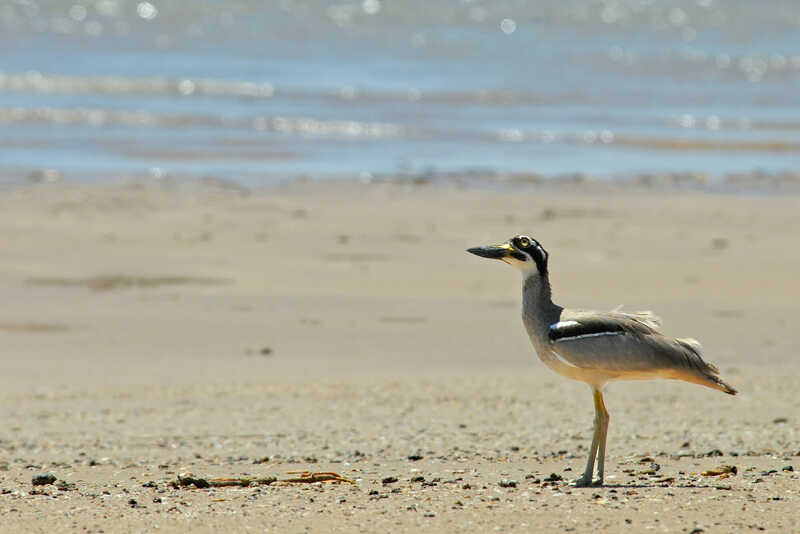 A weary Beach stone curlew foraged in the sand, dozens of Black kites perched on the branches of dead trees and dozens more circle overhead, while Red-capped plovers darted along the beach. The rock shelves were overtaken by the breeding colonies of Crested terns, Little terns, Caspian terns and Silver gulls. Slightly further along the rock shelf a mixed group of Great knots and Red knots whiled away the afternoon. 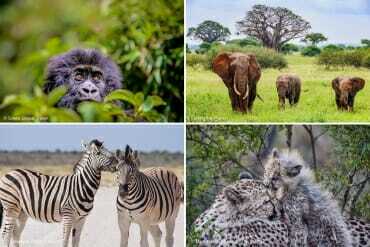 It is amazing how many different species we, humans, displace when we take over an area. We took a ferry to Mandorah island on a friend’s advice, who told us about a bat colony roosting underneath Mandorah jetty. 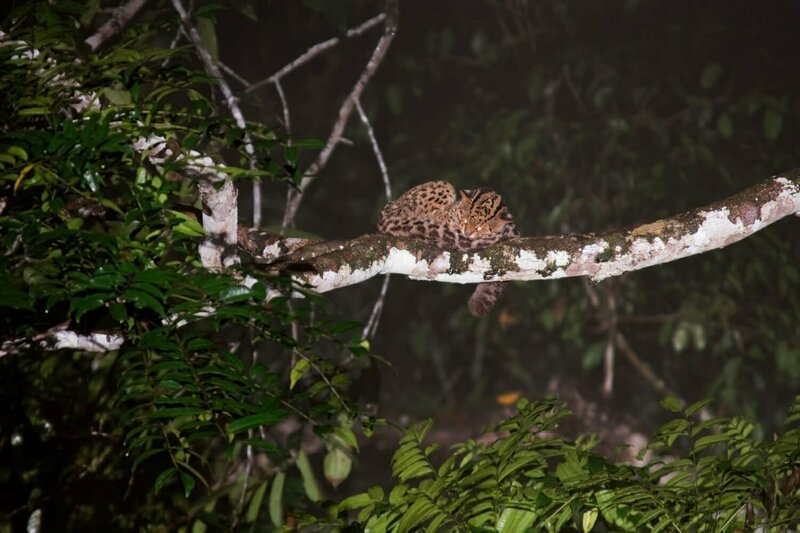 At night, we drove back to Fogg Dam, simply because it was the best wildlife watching spot around. Apart from the usual suspects, we spotted a Dingo, a slaty-grey snake, a Northern brush-tail possum, a Barn owl and sadly, a dead Northern Brown Bandicoot on the road. But the most interesting creature we came across was the Northern death adder. Australia is famous for being home to most of the world’s poisonous snakes. Out of 25 most venomous snakes in the world, 21 live in Australia, and the Death adder is one of the top 10 most venomous Australian snakes. I did get out of the car to photograph the silent killer as it was crossing the road, but I wouldn’t recommend it to anyone with a healthy sense of self-preservation. The drive back may seem like a daunting task – you will be retracing your steps for over 3,000 kilometres. But the beauty of it is – it gives you the chance to re-visit your greatest hits of the trip. And if you planned the trip wisely, you’ve left a few destinations up your sleeve to check out on the way back. That’s plenty of excitement to keep you motivated. Woah, what an amazing trip! My husband and I just booked our flights to Australia for the holidays. We’re starting to plan where we’re going to visit so this is super helpful! 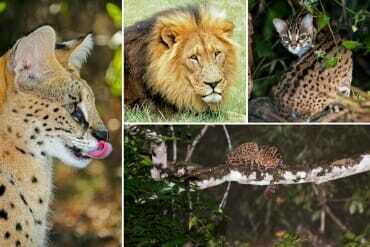 Wow all of these animals look so cool! I’m stunned that you managed to capture this many on camera (I am absolutely terrible at taking pictures of animals lol). Thank you, Lauren! I would love to have bears as neighbours :)! We do have a few poisonous spiders, but you don’t really come across them too often unless you go sticking your hands into leaf litter or leave your shoes outside your tent when camping :). Venomous snakes are a bit more common.